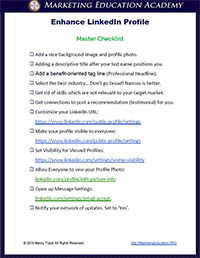 Learn how to maximize your AUTHORITY and VISIBILITY on LinkedIn. This is the same Cheat Sheet and Reference Guide we give to our paid certification students. Get it free. Remarketing is a method of using pin-point advertising to stay in front of known prospects, or even those who anonymously visited your website. You’ve probably experienced remarketing when you were shopping on Amazon, then left without buying. Later that day, while you were visiting a completely different website, you saw an ad for the exact thing you were looking at on Amazon. This is remarketing. What happened is that Amazon digitally tagged you when you visited the site. With digital tagging, you don’t identify the individual. Instead you identify their phone or their computer, and tag it by using remarketing code (tracking pixel) to add a cookie to your prospects device. The prospect remains anonymous, but the cookie enables 3rd party sites to identify their site visitors as being your prospects and show them your ads. This tactic allows you to repeatedly stay in front of your known prospects, and keep them moving in the right direction. According to ComScore, this method of targeting produces better response than any other method of targeting. This is a powerful branding tool, AND a proven way to bring people back to our sales pages. You can leverage the remarketing platforms at Adwords and Facebook only once you have a remarketing audience. Your remarketing audience can be imported into the ad platforms from a list. An audience can also be created over time, as people visit your website. If you have a list of good prospects, you can get started on this anytime. We’ll cover the tactic in some detail later. The reason I mention it here in this section is because the tagging process is a form of a handshake. Besides that, it can take time to accumulate a remarketing audience. If you plan to remarket to your website visitors, you need to start tagging them now. You will want to setup audience tracking on both Facebook and Adwords. Marketing instructor, Benny Traub, is available to help. Need advice? click the button below.